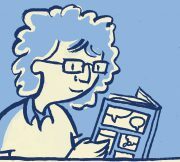 Some definitions of the common elements of comics will help when reading about graphic novels and comics. Comics (as a medium) includes multiple forms within the medium of comics including comic strips, comic books, graphic novels, and manga. (Thompson, 2008. Adventures in graphica: Using comics and graphic novels to teach comprehension, 2-6. Portland, ME: Stenhouse Publishers). A graphic novel is a static and sequential book-length narrative in which verbal and nonverbal elements work to support each other, bounded by page and panel, to tell a story impossible to convey using only one or the other (Jiménez, 2012). Hue, gradation between segments of the visible light spectrum. Provides the stimuli that allows us to distinguish color – e.g. blue, turquoise and green. Also known as color (Bang, 1991. Picture this: Perception & composition. Boston: Little, Brown). Saturation, dominance, intensity or purity of the color. In printing, it refers to the amount of pigment used in creating the ink (Eisner, 2001. Comics and sequential art (2 ed.) Tamarac, FL: Poorhouse Press). Line, a basic building block of illustrations. Lines can be used to express mood and evoke senses, including the sense of motion. Lines have style and expressivity from feathery and light to angular and heavy (Bang, 1991. Picture this: Perception & composition. Boston: Little, Brown). Gutters, the space, usually white, between the panels of a comic. The reader imagines the action that links the two static images and transforms them into a single idea (McCloud, 1994. Understanding comics: The invisible art. New York: HarperCollins). Panel, acts as a general indicator that space and time is being divided. Usually constructed by a line (McCloud, 1994. Understanding comics: The invisible art. New York: HarperCollins; Eisner, 2001. Comics and sequential art (2 ed.). Tamarac, FL: Poorhouse Press. ).